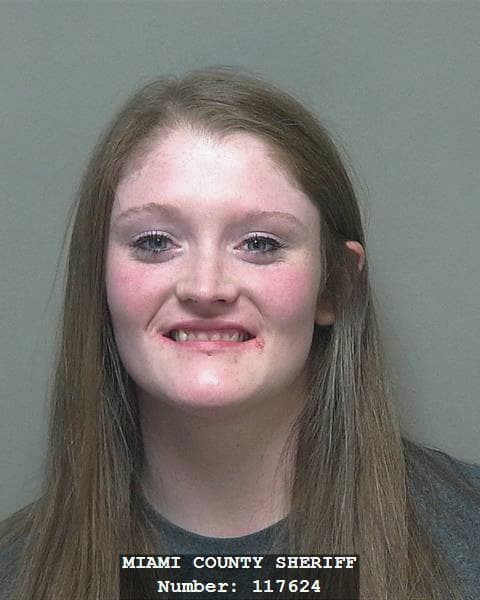 MIAMI COUNTY —The granddaughter of the elderly Tipp City man discovered dead in a Kentucky park appeared in Miami County Common Pleas Court on an unrelated drug charge on Monday. Hope Earnshaw-York, 24, of Tipp City, was arraigned on a fifth degree felony possession of heroin charge with Judge Jeannine Pratt presiding. York entered a plea of not guilty. Miami County Prosecutor Anthony Kendell said York was in her last trimester of pregnancy and she should remain incarcerated to protect the health of the baby from potential drug use. York denied drug use and said she had a job interview at a local produce farm on Wednesday. Judge Pratt continued York’s $10,000 cash or surety bond at Prosecutor Kendell’s request. Pratt scheduled a pre-trial conference with Judge Christopher Gee at 2:30 p.m. June 15. Earnshaw-York remains incarcerated in the Miami County Jail. Earnshaw-York was arrested last week with a warrant for a grand jury indictment for the drug charge in December 2014. On June 4, Tipp City Police Department confirmed that the body found in a northern Kentucky creek was 88-year-old William York Sr. who was reported missing from his Evanston Road home on May 30. Police confirmed they were investigating a homicide. Court records implicate York’s granddaughter, 24-year-old Hope Earnshaw-York and her boyfriend, 35-year-old Richard Terrel. Neither one have been charged with a crime related to William York Sr.’s homicide as of press time. Terrel was jailed on June 3 for fifth degree felony complicity to receiving stolen property belonging to York. The documents further allege that Earnshaw-York was in possession of checks and ATM cards belonging to her grandfather. Terrel is set to appear Miami County Municipal Court on Thursday. His bond was set at $50,000 cash only bond. The court documents state that this arrest is part of the ongoing investigation into York’s disappearance and death. She and Terrel were both living at York’s residence, documents show. York was reported missing May 30 from his Evanston Road home. On June 1, Tipp City Police were dispatched to a welfare check on William York at his home on Evanston Road, Tipp City. Family members said they were concerned about the well being of William and said they had not heard from him in several days. Neighbors stated they had not seen him since May 27. Police issued a statewide endangered missing person alert for York on June 2. On June 3, Boone County authorities recovered a body around 2 p.m. believed to be York. The remains were found in a sleeping bag in Gunpowder Creek in Union, Ky. Graham said investigators traveled to the scene and confirmed that the remains were York. According to court documents, Earnshaw-York had been staying with her grandfather for several months with her 3 year-old son. Relatives stated Earnshaw-York said she was in Kentucky with Terrel, and she was also in possession of York’s truck, a silver Chevrolet Silverado, which was later recovered in Butler Township. In the months before his death, York contacted police twice about items he believed were stolen from his home. In May, York reported to Tipp City police that seven guns were missing from his gun case. He did not want to pursue further action at that time, saying that he wanted police to know the firearms were missing. In February, York alerted police to the possible theft of papers from his home. He stated that the missing paper contained notes referencing the creation of a will. Agencies involved in the investigation include the FBI, Ohio Bureau of Criminal Investigation, the Miami County Sheriff’s Office, Miami County Prosecutor’s Office and officials in Boone County, according to Tipp City police.